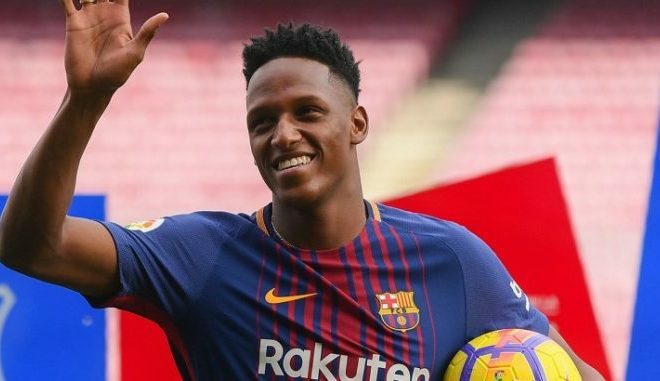 Manchester United chief Matt Judge has landed Spain in a bid to seal the signing of Barcelona’s Yerry Mina for an asking price of £35million. United have been busy in the transfer window recently, trying to get Toby Alderweireld and Harry Maguire signed but haven’t succeeded, the clubs have turned their focus the 23-year old Columbian defender as they hope to get him signed to the club. Meanwhile, Mourinho is said to have pleaded in a meeting with officials of the Red Devils, to sign a new centre-back that should bolster his squad strength and Mina happens to be the best option available. Reports from The Sun suggests that Judge will be meeting with Mina’s agent Fellipe Russo to facilitate the fast signing of the player as the transfer deadline is almost here. Mina’s asking price was formerly set at £44million but the Spanish champion dropped the price making United even more interested as they see the signing of the world class defender as a cheaper option. The players recently linked with an interest from United, couldn’t be signed as United tagged the asking price of both Maguire and Alderweireld to be on the high side. Mina can be said to be close in signing a deal with United as it appears everything is almost in place and has personal interest in playing for the club, it is hoped that by tomorrow, his fate gets decided.